From the castles of Hohenschwangau and Neuschwanstein there is a splendid view of the Alpsee. It covers an area of almost one square kilometre, with just under five kilometres of shoreline and a depth of up to 62 metres. The lake nestles between wooded mountain slopes in an area of unspoilt natural beauty which was already popular in the 19th century – the Bavarian kings built their romantic castles here on sites originally occupied by the strongholds of medieval knights. Today there is a wide variety of hiking trails in the vicinity, and on almost all of them you are following in royal footsteps. This is true of the circular path leading round the shore, which is more or less in its natural state and is protected as a nature reserve, and also of the "Fürstenstrasse" (Princes' Road). This leads from Hohenschwangau over the Schwarzenberg ridge and down to Pinswang in the Lechtal. 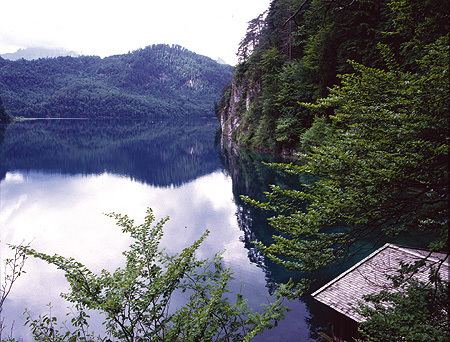 The Alpsee is located approximately 4 km southeast of Füssen near Hohenschwangau Castle.